BUENA VISTA, Va. — Laboring under the belief that places with Hispanic-sounding names must be full of illegal immigrants, President Donald Trump has imposed economic sanctions against Buena Vista and has sent a team of Immigration and Customs Enforcement (ICE) agents. 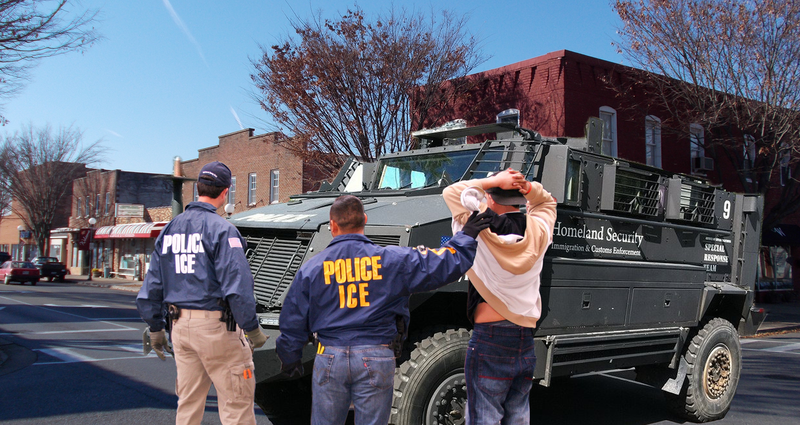 ICE agents conducted early morning raids throughout the Rockbridge County hamlet yesterday as a part of a program aimed at curbing illegal immigration in towns and cities the president is unable to pronounce. “The president feels that illegal immigrants will likely gravitate toward places with cultural similarities to their home countries, so he has directed Immigration and Customs Enforcement Officers to lock them up, starting with Buena Vista,” Sarah Sanders, White House press secretary, said. Buena Vista, or “Bew-na Vis-ta” as locals pronounce it, has a population of just around 6,600 and is over 90 percent white. It is also home to Southern Virginia University, a small private college affiliated with The Church of Jesus Christ of Latter-day Saints. Residents said they were surprised to be the target of immigration raids, given that the town has a Hispanic population of perhaps one percent. Henry Fleming, owner of the Magnolia Diner, said that agents stormed into his business and arrested his dishwasher, Steven Phillips. “It was crazy. One minute I’m making hollandaise, and the next armed men burst through the door and handcuff Steve just because he is from Durango, Colorado,” Fleming said. Agents quickly released Phillips after determining he was a U.S. citizen and apologized for their error. They called it an honest mistake as Phillips had just returned from a beach vacation and was rather tan. The lack of success in Buena Vista has not stymied the White House, which remains undaunted in their efforts to address the issue. In a statement, they listed Cuba, New York, and Cadiz, Kentucky, as their next targets for immigration raids.